Sundays are really about pancakes. In our house, that means gluten (wheat) free, casein (milk) free, soy free and artificial anything. They were delicious! Mix the wet items together in one bowl and mix all the dry ingredients together in a separate bowl. Then mix the dry ingredients into the wet and mix well. 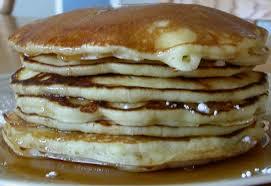 In a hot non-stick skillet, heat up a bit of canola oil and scoop 1/4 cup for each pancake. Enjoy with 100% maple syrup or as Jack likes it, sprinkled with sugar. Yum!